Mr. Tim Chesnut is the HS principal at West Monona Community Schools. 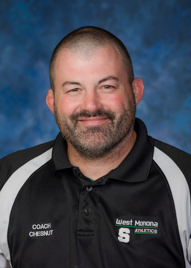 He received his BA from Upper Iowa University, and eventually earned a teaching position at West Monona. After a 15 year teaching career, Tim received his MA from the University of South Dakota and accepted a position as the school's assistant principal and athletic director. In 2015 Mr Chesnut began working in his current role as the school's lead principal. Mr. Chesnut supports student-centered classrooms and believes students should be actively engaged in their learning. He is a proponent of providing a variety of experiences to students, so they can learn by doing. Furthermore, he believes schools should focus on the whole child, and provide students with personalized learning to meet their individual needs. Mr. Chesnut views his experience-based approach as the best way to develop problem-solvers capable of lifelong learning. In addition to his role as principal, Tim enjoys coaching wrestling, traveling, and being outdoors. He rarely misses an opportunity to cheer for his Bears, Hawkeyes, and Cubs. Iowa Administrative License (PK-12), Iowa Evaluator License (PK-12). American History, World History, American Government, and Athletic Coaching (K-12). West Monona Community Schools, 1999-present. United States Marine Corps, 1992-1996.